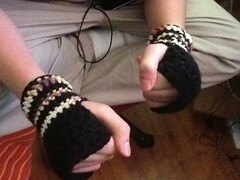 A fingerless glove crochet project. These work up fast in worsted weight cotton yarn. This is a good pattern for carrying the yarn, since each color only needs to be carried one or two rows once the second color is added in. Adjustments are included for longer hands or partially covering the fingers, but these are most comfortable up to the knuckles. ~ 150 yards worsted weight in a main color (i.e. black). ~ 50 yards in a worsted weight contrasting color (I used a camo multicolor yarn). Small (Medium, Large): Small is for average width teen boys & women's hands, medium is for average men's hands, large is for wide men's hands. The number of palm rounds will depend on the length of the person's palm, and whether they want the covering up to the knuckles, or to partially cover their fingers. 3 rounds covers an average woman's palm to the knuckles, 4 rounds an average man's palm or partially covering teen/women's fingers, and 5 rounds will partially cover an average man's fingers. Each palm round (3-5 rounds, see Palm Note above): ch 3, dc in each stitch to end, join to beginning ch3 with slst. 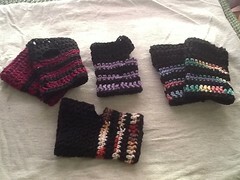 Thumb round 1 (right): ch2, hdc 1, ch 4 (5, 6) very loosely, skip 4 (5, 6) stitches, hdc to end, join with slst. Thumb round 2 & 3: with C: ch1, sc in each stitch to end, join with slst. Wrist round 1: with B: ch2, * hdc 10 (12, 14), decrease 1, repeat from *, join with slst. Wrist round 2: ch 2, * hdc 9 (11, 13), decrease 1, repeat from *, join with slst. 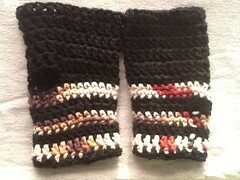 Wrist round 3 & 4: with C: ch1, sc in each stitch to end, join with slst. Wrist round 5: with B: ch3, dc in each stitch to end, join with slst. Wrist round 6: with C: chain 3, dc in each stitch to end, join with slst. Wrist round 7: with B: chain 2, hdc in each stitch to end, join round with slip stitch. If finger area is too loose, sl st either color at finger end with a smaller hook, sc to end, and cut yarn, pull through slst, weave in loose end. Bottom: Male teen w/5 palm rows. 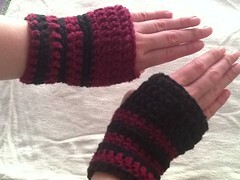 Based loosely on The Boyfriend Gloves which it ended up was a UK pattern (double crochet UK = half double crochet US).